Robinson went to college on a track scholarship and only played football in his last year. He was chosen by the expansion Bengals in the third round of the 1968 AFL/NFL draft, moved directly into the lineup, and scored the first regular season touchdown in franchise history. Bengals went 3-11 to finish fifth in the AFL Western Division. The smooth-running Robinson never again matched the production of his rookie year. 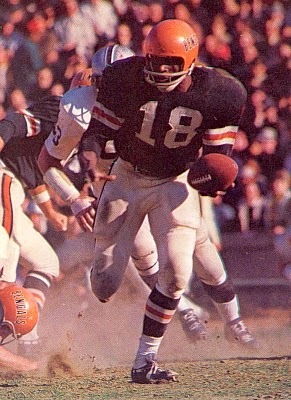 His rushing total dropped off to 489 yards in 1969, although he was still chosen to the last AFL All-Star Game. With a strong second half, he reached 622 yards in ’70 but carried only 49 times for 213 yards in 1971 and was traded to the Oilers during the ’72 season. Robinson was a backup with Houston in 1973 and left for the Birmingham Americans of the WFL, where he played one final season in 1974 and led the team in rushing with 599 yards on the way to that league’s only championship. In the AFL and NFL, Robinson rushed for 2947 yards on 737 carries (4.0 avg.) and caught 90 passes for 612 more yards, scoring a total of 26 touchdowns. While his career failed to live up to the early promise, Robinson remains the only player to rush for a thousand yards for a first-year expansion team in the AFL/NFL.